If you’re married and running an obstacle course race, one great piece of advice that people give you is to take your wedding ring off. As a happily married man, I don’t like the idea of taking my ring off because it implies that I’m choosing between my marriage and my love of OCR. Since I spend a good deal of time training and doing events, I am very conscious of any subtle suggestion that I’m more committed to training than my marriage, so I always leave my ring on during training and events. 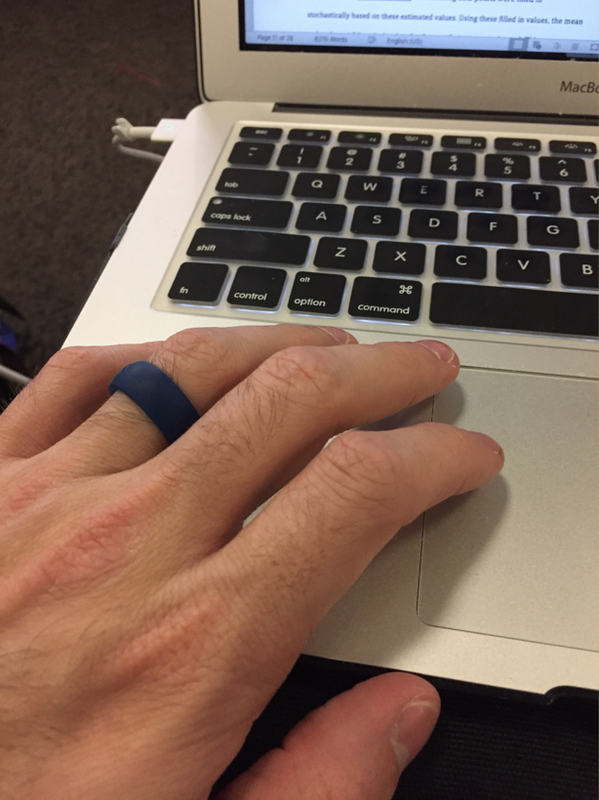 Here’s how: I wear my QALO ring. A little bit of Christmas joy. My original wedding ring is a heavy tungsten wedding band that we got because of my active lifestyle. It’ll shatter before it’ll bend to trap my finger. There is a risk that if my finger swells around it, it can’t get cut off, but that’s lower risk. Almost immediately after I started wearing my similar tungsten engagement ring (we believe in gender equality), I noticed that my grip wasn’t the same. The ring makes every grip a little larger and it creates a pressure point over that finger that’s a recipe for pain, blisters and skin rips. I didn’t like it, but I took my ring off for my daily training sessions and any obstacle event that I did. Since I train a lot, that’s a good deal of time spent without my wedding ring on. 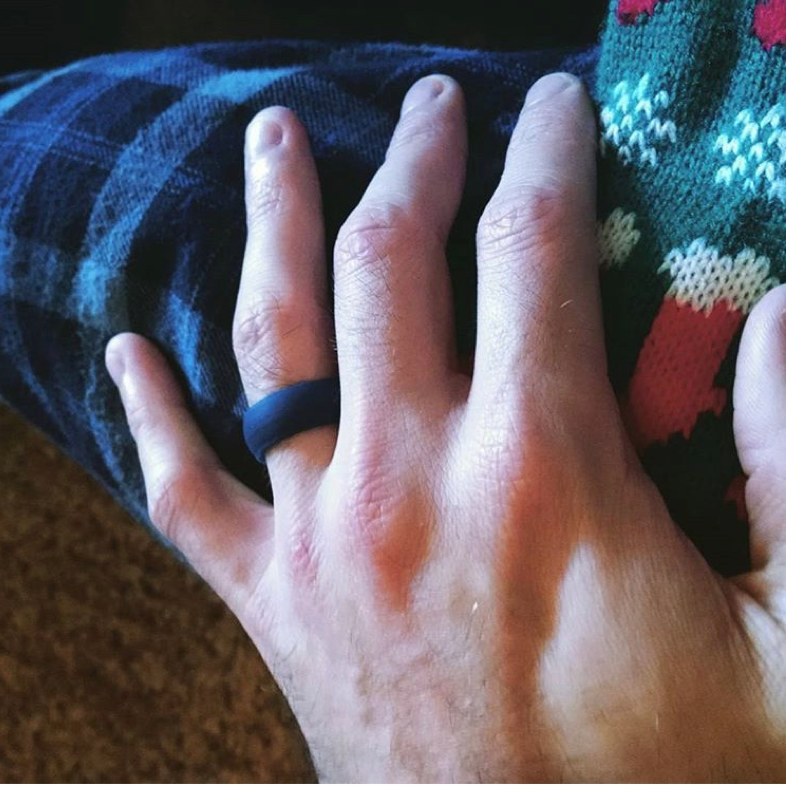 Being conscious of those issues and others, my wife had the idea to give me a QALO ring for Christmas in 2015. Instead of being metal, these rings are silicone. The silicone has the capacity to stretch and be compressed when under pressure. Consequentially, when I grip heavy water jugs or jump up to do rings or a bar, I barely notice the ring at all. It distributes the weight evenly across my hand and I can do my workouts as if I didn’t have a ring on at all. There might be a small difference between my grip with the QALO ring and bare-handed, but I don’t notice it. After 4 laps at the Landshark Challenge my red QALO ring matches my tights, Team Rubicon hat, and red solo cup. The main concern that I had in wearing it for events was my hands getting wet and slippery: would the ring slip off during the first obstacle. Then I’d be out $20 and in the same position I was in before. I decided to take the risk during my first Tough Mudder of the year in San Bernadino, where I ran two laps of the course and was constantly in water, gripping ropes, and relying on my grip to get me through some tough new 2016 obstacles that I wasn’t used to. I didn’t fail a single obstacle that day. I made it through the pendulum of Funky Monkey with dirt and grime all over my hands, and my grip didn’t fail. I climbed up the rope of Balls to the Wall without getting the hairs of the rope stuck under my ring. During my second lap, when I was helping as many people as possible through the obstacles, I felt good when I stuck out my left hand to help someone, and it stuck. I noticed a subtle change that ladies didn’t seem to think I was hitting on them by helping them over an obstacle. They just enjoyed my helping hand and moved on. That’s one of the perks of married life. The main issues with the ring are the aftermath. Since the silicone of the ring is semi-porous, it holds more moisture than a metal band. That means that the skin under and around the ring is wet for longer, and can get break more easily with prolonged exposure. If you’re doing a 24 hour event that has you in and out of water constantly, there’s not a big difference between the skin around the ring and the rest of your hands because everything’s soaked at all times, but if you’re doing a shorter endurance event that has mild water, the moisture is going to hang on longer to effect slightly more obstacles than it would otherwise. Past the event, washing your hands is a little more cumbersome because you need to be conscious to wash and dry under and around the ring. I think you should do that even if you’re wearing a metal band anyway. The other concern is that since the ring is soft, stretchy and getting exposed to the worst of the worst conditions, it’s got to break all the time. When I read reviews of the ring before we purchased it, I got the impression that with regular wear, each ring would last about a year, so we’d be investing $20 per year on my ring instead of the hundreds over my lifetime for a metal ring. So far I’ve taken the ring through more than 200 miles of Tough Mudder, many hours of Spartan Races and Hurricane Heats, and the SISU Iron. I haven’t broken or lost a ring. Not even once. I’d had three QALO rings for a little over a year now, so maybe I’m due, or maybe they last longer than I expected. Disclosures: I have no relationship with the QALO company. I’m not sponsored or an ambassador. I have never received free products from them. Just a fan of their product. Dr Redtights is a Tough Mudder Ambassador, GoatTough Athlete, 4x WTM'er (80 2+ team miles/2nd in 2017, 350 lifetime WTM miles), Ironman at the SISU Iron 2016 & 2017, 1st invitational champion HH12HR, Ultramarathon runner, Athlete vs Epilepsy, PhD Scientist and MD in residency to become a Neurologist. Instagram: @drredtights. 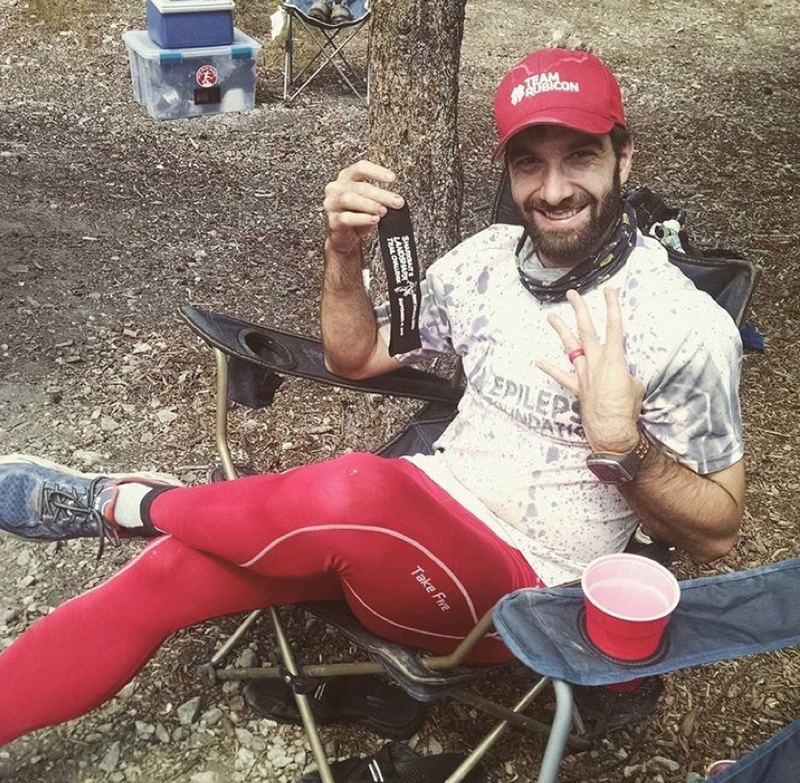 Supported by Marena Sports, VRGata Athletica, Honey Badger, and Trail Toes.